We took the red-eye flight out of Abu Dhabi to London. This departs Abu Dhabi around 2 in the morning and gets to London around 7am. With all the time difference, the flight time is about 7 hours.The aircraft we used was a Boeing 777-300 ER (with First Class Cabin). 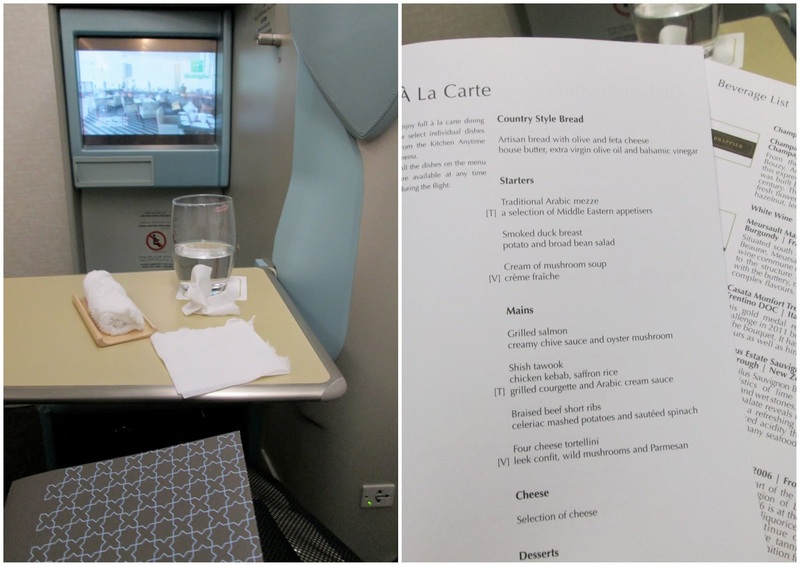 This is the newer business class product, compared to the New York-Abu Dhabi aircraft. The only marked difference I can see, apart from the colour scheme, is that the newer product had more compartments for water bottle, magazine, chargers, etc. The business class seating on this aircraft is 1-2-1. 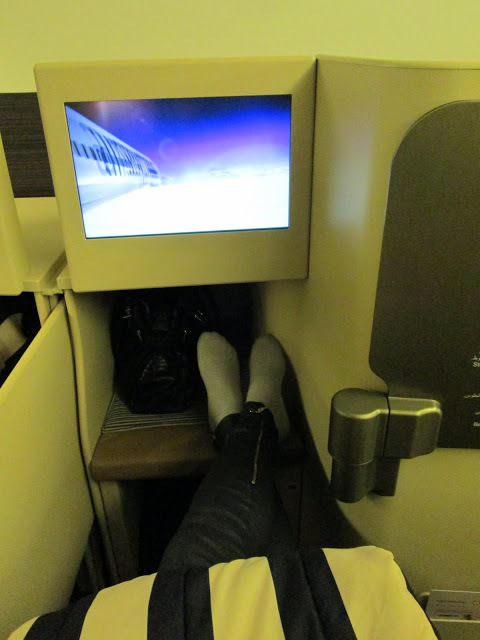 I was on the “2” part of it, and you can see on the left side of the photograph, there is a divider between the 2 seats. This is lowered normally when honeymooners occupy the 2 seats. However if the person next to you is a stranger (as was the case on my flight), it is left upright. I can still see what the lady was watching on her screen, but I cannot see her face. Because I was pampered in the Business class lounge back in Abu Dhabi, I didn’t really feel the need to sleep despite this being a red-eye flight. What does one do then? EAT! 3-4 AM snack. 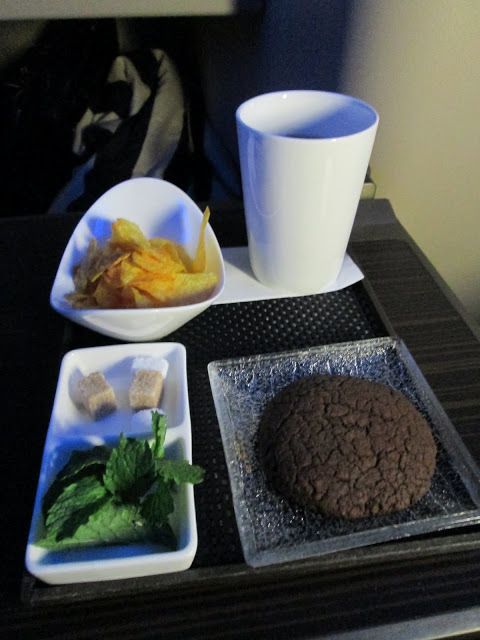 I ordered a chocolate cookie, with potato chips and Moroccan mint tea. I watched a travel guide show featuring London. I was excited. The last time I was in London was 2005. Too long ago! Hello Grilled Steak Sandwich! (And potato chips and Moroccan Mint Tea again). I could get used to this!! 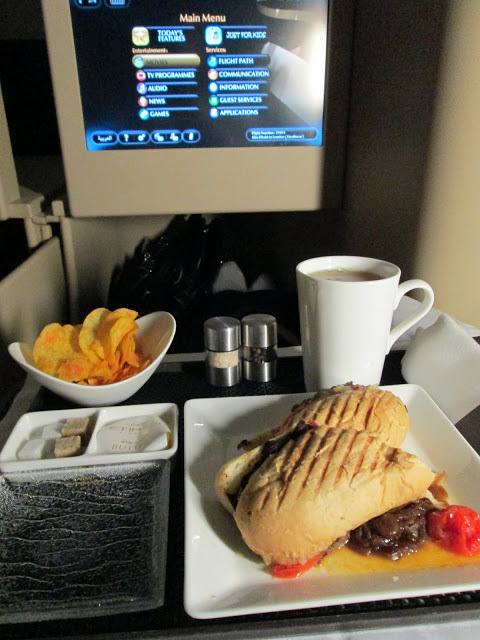 Service was really impressive, the cabin crew were attentive but not intrusive and very polite too. Real time surveillance outside of the aircraft! I wish I took a picture of it when we were actually landing. It was cool! Very different from just watching it from your window. We were given an Etihad Fasttrack card. 6-10ish AM is the peak time for arrivals in Heathrow. This card allows you to go through Immigration quicker. 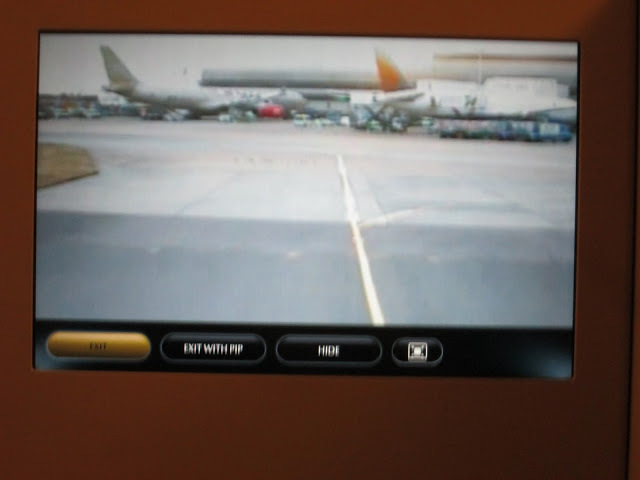 But we were also escorted by an Etihad representative in London , so we were “Super-fast” Tracked out of Heathrow. Very pleasant and quick flight, I would highly suggest taking this if you need to attend to business in London during the day. Just don’t stay up the whole time like me. 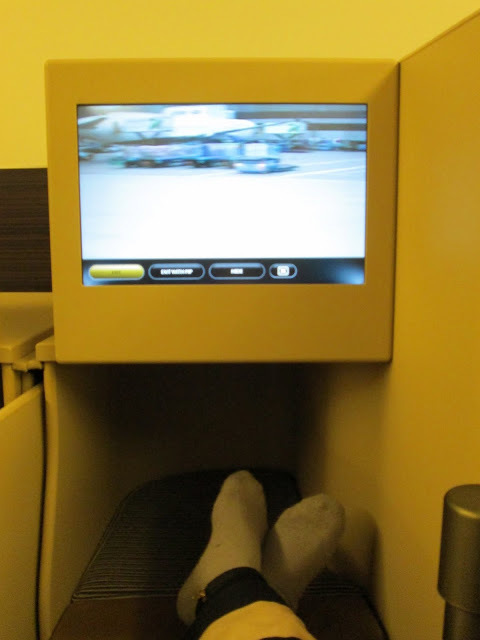 You Will sleep like a baby in the Etihad Pearl Business class zone on this red-eye.